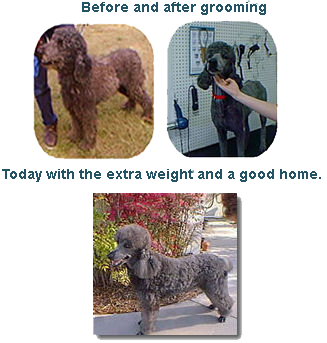 This month’s success story is about Jacques, a five year old standard poodle who was left tied to a fence. He was heavily matted, underweight, and apparently had not been given much in the way of preventive care. As soon as he arrived at the shelter it became obvious that this was one sweet dog. Once he finished his mandatory five-day stay just in case someone claimed him, he was tested and moved to the adoptable side of the shelter. Although he was as sweet as can be his appearance seemed to turn many potential adopters off. He needed grooming desperately and thanks to the staff at Adorable Pets and a visitor to the Humane Society who donated money for grooming, he was soon looking much better. The grooming took all day, which is much more than the normal grooming fee would cover. Mike and Joyce, who are the folks who generously donated the money for grooming, adopted him but his story doesn’t end there. Although his heartworm test was negative at the shelter, when taken to the vet his test was positive. He has now been successfully treated and is doing well. Since that time, we have implemented a new Adoptable Treatable Program which uses donations to help pay for costly treatment of medical conditions in order to allow otherwise healthy, loving animals an opportunity for a new home. Hopefully more animals like Jacques can be helped in the future. See our Donate page for more information. Prevention of heartworm is much less expensive than treatment of the disease which can be fatal. Make sure your pet has all the preventive care recommended. If you no can longer care for your pets, do no leave them on the street to fend for themselves. Bring them to the Humane Society. There is a voluntary surrender fee to help care for them while we try to place them. If you suspect an animal is being neglected or see an animal actively being abused, call Animal Control. Trained personnel will evaluate the situation and determine if intervention is needed.